Behold, one will fly swiftly like an eagle and spread out his wings against [Moab] the enemy (cf. 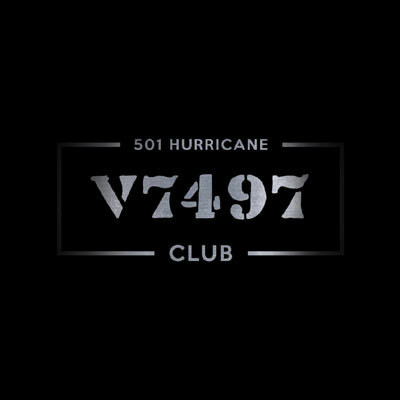 Jeremiah 48v40). Many of you probably didn’t know that in recent years, because of an old haemorrhage at the back of his eye, Grandad was functionally blind in his left eye. He came to see me at Medi Optics four years ago very concerned that the vision was also going in his right eye, his good eye. He had developed dense cataracts. I referred him, and he was subsequently operated on at the Bristol Eye Hospital, and the vision in his right eye was completely restored. There is nothing remarkable about that – over the years I have referred hundreds of patients for cataract surgery. But there was something quite unique about this particular case, and Grandad took great pleasure in this story. During the WWII an eye surgeon called Harold Ridley noticed that when he examined Spitfire and Hurricane pilots who had been shot down and had shards of their cockpit canopies embedded in their eyes, there was no reaction, no inflammation and no infection. Perspex was found to be one of the most biologically quiet materials ever made. Without modern antibiotics and anti-inflammatory drugs, removing the Perspex would cause sight threatening damage. This gave Harold Ridley the idea to make lens implants out of Perspex, so that when he removed a lens in cataract surgery he could put in an implant to restore the vision. This technique is now applied worldwide. So some 70 years after that discovery those Spitfire pilots were in part responsible for the restoration of Grandad’s vision. At 93 years old, and having a dynasty of four generations there are endless possibilities for reminiscences, with the chance of missing someone out. So I thought the best thing to do was to let Grandad do the talking for us. Soon after his cataract operation he wanted to talk through his flying logbook. So I audio recorded several of his stories. He logged a staggering grand total of 1,065hrs and 45 mins of flying time! The listed types that he flew include: the Tiger Moth; the Harvard; Miles Master Mks I, II & III; Spitfire Mks I, II, V, IX & XVI; the Hurricane; the Tempest V; the Oxford; the Auster; the Mustang Mk III; a Lancaster – which he took off, flew and landed although he was not allowed to power up engines at the start of the flight! ; he mentions that he flew a Mosquito, and later after the War he flew a Meteor. So that’s experience on 18 different aircraft types – that’s an impressive range of types. Of all those aircraft his favourite was always the Spitfire, which he described as, ‘Docile, you didn’t have to think about flying it. You didn’t fly a Spitfire – you wore it.’ The Hurricane was, ‘A nice plane to fly, but not a patch on the Spitfire.’ The Tempest was, ‘Fantastic! Faster than the Spitfire, better visibility and a better gun platform.’ ‘The Mustang,’ he said, ‘was lovely, very sophisticated’, but again not as enjoyable as the iconic Spitfire. He joined the RAF age 19yrs. He put himself forward as an air gunner. At interview he was asked, ‘Why not a pilot?’ He said that he thought that he didn’t have the qualifications to be a pilot. The interviewing officer said, ‘Nonsense!’ and stamped his file ‘Pilot’. After basic training he continued his flight training in Rhodesia. His first solo flight was on the 16thJanuary 1942. On returning to the UK he first flew a Spitfire, a Mk1, 72 years ago this Sunday – 14th December 1942. He was particularly skilled at low level and night flying. He was selected for the so called ‘rhubarb’ missions where they flew in at sea level to northern France and the Low Countries spotting shipping, attacking bridges, trains and marshalling yards. It is poignant to think that as we recall the life of one fighter pilot who flew those first ‘rhubarb’ missions, there are RAF pilots today flying similar missions over Iraq. With over 1,000 hrs of flying time there are so many interesting stories in his logbook, but there just isn’t time here to do justice to them, so I will select just a few. In the days before D Day he flew several reconnaissance missions over the English Channel taking pictures and on convoy patrol. D Day saw him flying three separate missions in a Spitfire Mk V during which he encountered heavy flak and saw some artillery action. On the subsequent days and into July 1944 he was providing low level beach cover. 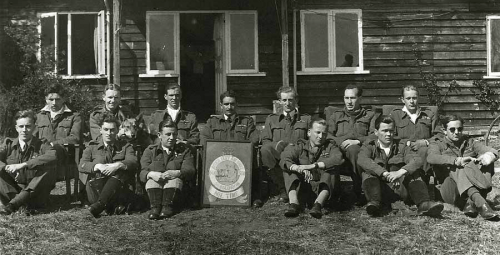 At the end of July 1944 he transferred to the Tempests, which were tasked with hunting down the V1 ‘doodle bugs or Buzz Bombs’ – 501 Squadron had to attack the V1s which made it through the first line of defence, the Mosquitos. He shot down his first V1 on the 27thAugust 1944. 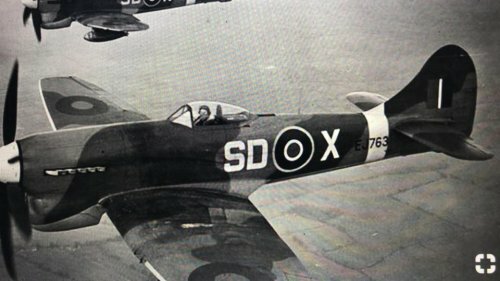 On the Hawker Tempest V website there is an account written by Grandad about his first V1 success – it is well worth reading. On the 16th October 1944 a news reel crew visited Bradwell Bay to take some PR shots of the Tempest crews low level flying. I asked Grandad how low he could fly. ‘Almost down to zero feet!’ came the reply. That news reel film is at the Imperial War Museum. I have a copy. In the foreground there is a Wellington Bomber. One can judge the height of the various Tempests flying by relative to the tail plane of the Wellington. The Tempests go lower and lower. Then the last one, ‘SD-G’ flies at high speed below the height of the top of the Wellington’s tail plane! The logbook shows that on that day ‘SD-G’ was flown by Ron Bennett! On Saturday 16thSeptember 1944 Grandad borrowed a Tempest V and flew home to Bristol for the weekend, returning to Bradwell Bay the following day. I doubt if today’s fighter pilots would be allowed to borrow a Tornado for the weekend! A few weeks later, on Thursday 6thOctober, he borrowed a Tiger Moth for another overnight trip to Bristol. Unfortunately on the return trip the next day he ran out of fuel 5 miles short of Bradwell Bay and made a forced landing, clipping a hedge on his way down. The red note added to his logbook by the Officer Commanding North Weald Sector on the 23rdNovember says, ‘Lack of fuel – gross carelessness!’ He got away with it because between the forced landing and the dressing down he shot down another two Buzz Bombs, taking his total to four. The entry for 25thSeptember 1945 states, ‘Here endeth my flying career’ having logged a total of 952hrs 35mins. However, in February 1946 he is flying again, getting his hands on a Spitfire Mk XVI. The log records that he was withdrawn from Air Crew Duties after 982hrs 10mins in April 1946. In July of the same year he is logged flying a Tiger Moth out of Filton, where his last flight appears to have been on the 25thJune 1949. However, there is a certificate from the Central Flying School dated 21stDecember 1951 when he graduates as a Qualified Flying Instructor. This was the world’s premier flying school, way ahead of the American equivalent ‘Top Gun’. There are no records in the logbook for flights taken whilst at the Central Flying School, although he did mention that he converted to jets and flew a Meteor. His Central Flying School Instrument Pilot Rating ‘Green’ Card was last renewed on the 20th October 1953. I once asked him whether he was affected by his wartime experiences or suffered from what would now be called post traumatic stress disorder. He said, ‘No’ but if he could not sleep he would delve into his memories and select a mission from his logbook and fly it again. He preferred to relive the missions. Great Grandad Harry Bennett survived the WWI, Grandad survived WWII: try and work out the survival stats – one unlucky incident, one wrong move during any of those conflicts and the blood line would have been cut, and none of us from the 2nd, 3rd or 4th generations would be here to commemorate those 93 years. Now that’s a miracle well worth celebrating!! !